This review of CVS Athlete’s Foot Spray has been written to give customers a full analysis of the product that is used to treat foot infections and help in making a smart decision when it comes to buying this product. 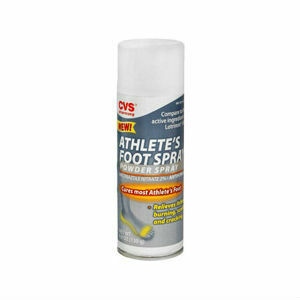 CVS Athlete’s Foot Spray is designed to provide relief from infections, which includes athlete’s foot and ringworm. The active ingredient Miconazole nitrate 2% present in the spray helps in healing and treating infections. Sprays provide a quick, convenient, no-touch application that leaves the active ingredient on the skin after the propellant and solvent evaporate. The product is available on its website as well as on other online shopping websites. Read on to learn more about CVS Athlete’s Foot Spray and whether this product is worth buying. The active ingredient in this spray is Miconazole nitrate 2% which helps in treating fungal infections. One should clean the affected area and dry it thoroughly. Before using it, one should shake the can well and hold it 6 inches from the area that needs to be treated. Spray a thin layer over the affected area twice every day (morning and night). If you have a case of athlete’s foot, be sure to pay special attention to the areas between your toes. Wear well-fitting, airy shoes, and your socks at least every day. One should use it daily for 4 weeks to treat athlete’s foot and ringworm and 2 weeks to treat jock itch. If the condition lasts longer, it is advisable to consult a doctor. The product is priced at $8.29 on the product’s website and there are no discounts or offers available on the product. There is no guarantee being provided by the manufacturer and that can make you a little unsure whether or not they should buy this product. However, the positive reviews from existing customers may make you more sure of its effectiveness. The customer reviews are satisfactory and the consumers have recommended using the product to treat infections. CVS Athlete’s Foot Spray is backed by strong positive customer reviews and provides comprehensive details regarding the product as well as the ingredients that are used on its website. The active ingredient that is used in this product is safe for the skin and is effective in treating infections. However, a word of caution for women who are pregnant or nursing, as they should consult their doctor before using this product. One should stop using the product and consult a doctor if irritation occurs and if the athlete’s foot or ringworm does not improve within 4 weeks or the jock itch does not improve within 2 weeks. Since the product is flammable, one should not use it near a flame or spark or while smoking. The lack of a manufacturer’s guarantee makes it difficult for the customer to return the product in case he/she is dissatisfied with the product. Jimmy Rodriguez	reviewed CVS Athlete's Foot Spray	on November 19th	 and gave it a rating of 2.5.